If you like to check our rooms availability or you need help in planning your visit in Granada, we are happy to help you! 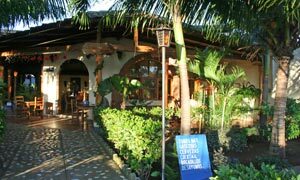 The "Corte del Maltese" ("Maltese" for short) is a small, friendly, recently built hotel located in Granada on the shores of Lake Cocibolca, also known as Lake Nicaragua. According to the GPS of our friends David and Pat Myers from Hallettsville, Texas, the hotel is situated 37 meters above sea level at 11° 55' 41.7'' latitude North and 85° 56' 30.2'' longitude West. "El Maltese" is the only hotel in Granada built on the lakeshore. It has ten large, bright, well ventilated rooms furnished with simplicity but good taste. All rooms have a private bathroom, air conditioning and tv. The hotel also includes a two-bedroom suite with a breathtaking view of the lake. Common areas of the hotel include a small front garden and porch, constantly ventilated by the light lake wind, a central patio with rocking chairs and tables, and a terrace with hammocks where one can relax, read, and chat with other travelers who come to Granada from all corners of the world. The hotel's restaurant offers continental, American, and Nicaraguan breakfasts and, for dinner, a varied menu of local and Italian specialties. The large and comfortable dining room is also available for birthday or wedding parties and business meetings. 'El Maltese' is a few hundred yards from the historical centre of Granada and very close to many attractions such as restaurants, discos, the main city harbor and the small docks where tourists can rent motorboats to visit the hundreds of small islands that make this part of the lake so interesting. The hotel offers mountain bike rental, boat tour reservation, and car rental services.